I searched for a tool that would let me create some kind of formatted file for each issue, giving the translations from short to long URLs. When finished with writing/creating that file it should be uploaded and be done with. I found no such tool, now there is one (mySSUS). Empty lines will be ignored, but you can enter them in order to make the data file readable. 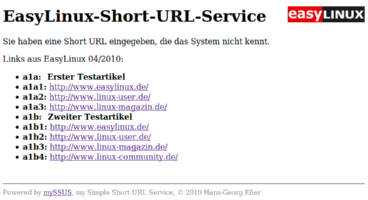 Separation of short and long URL happens with \t (tab) in this case, you can reconfigure mySSUS to use something different. However the separator should be something that will not appear anywhere else. If it does appear elsewhere, the tool breaks (it is "simple", as promised). Simple, isn't it? a2f9 would be the 9th URL in the "f" article of issue 02/2010. The file contains header entries (a1, a1a, a1b in the example). The first one (a1) is required for the file, it names the issue. The other ones (a1a, a1b) name articles, and they will be shown in some situations if available. This basically maps every file request to index.py unless there's a file or directory by that name. 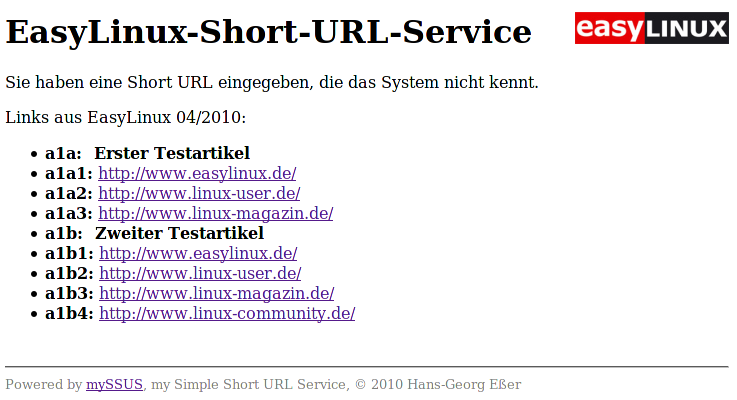 So don't create other content on the same host that looks like a valid short URL. Also you will have to provide at least one data file to make any use of the software, but it will work without one, just displaying the standard texts. mySSUS comes as a tar.gz archive containing index.py, a sample a1.data file and some documentation. The code is simple. It hardly does any error condition checking. It will not crash when it cannot open a data file, but that is all you get. Documentation within the code is in German language.